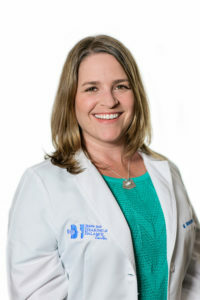 Dr. Michelle Blanchard earned her Doctorate of Audiology from the University of South Florida. She received her Bachelor of Science degree in Communication Disorders from Florida State University. Dr. Blanchard became interested in the field of Audiology after volunteering throughout middle and high school with deaf and blind/deaf individuals in her hometown of Cleveland, Ohio. Dr. Blanchard is the department lead at Tampa Bay Hearing and Balance Center. Her primary focus is with cochlear implants. She specializes in the evaluation process to determine patient candidacy and counsels patients regarding their status. Following surgical implantation, she does the fitting and mapping of the external speech processors and subsequent mapping sessions. She works with all three cochlear implant companies: Advanced Bionics, Med-EL corporation and Cochlear Americas for both new and old devices. She currently serves on the Audiology Advisory Board for Advanced Bionics and Med-el Corporation. Dr. Blanchard is trained in the areas of comprehensive audiological evaluations for patients of all ages, advanced hearing aid technology, Bone Anchored Hearing Aids (BAHA), Videonystagmography, Vestibular Autorotation, Auditory Brainstem Response, Electrocochleography, Vestibular Evoked Myogenic Potentials. She is also proficient in sign language. She is a licensed audiologist in the state of Florida and is a member of the American-Speech-Language-Hearing Association. Dr. Blanchard attends numerous professional seminars and workshops.